82 The LandReport | S P R I N G 2 0 1 6 LANDREPORT.COM A s the twentieth century drew to a close, the unwieldy nature of the B yzantine trust manifested itself. Guy's two children were no longer sharehold- ers; after their father's death, they had sold their interests to their cousins. That l eft the heirs of Electra and E. Paul, and by the early 1990s, they were in court. The ins and outs of the complicated case would require a special issue of The Land Report, but in essence the two sides were battling over whether or not to sell the ranch. And if there were a sale, at what price. And if one side of the family chose to remain on the ranch and not to sell its interest, which side that would that be. Neither contingent spoke to the other. This was especially uncomfortable for Electra's grandson, A.B. "Buck" Wharton Jr., and Gene Willingham, who married E. Paul's granddaughter, Helen Biggs. Although the two officed across the hall from one other in the W.T. Waggoner Estate Building, their principal means of communication was written memos. An avalanche of suits and countersuits literally went nowhere. They stayed put in the 46th Judicial District Court, where Judge Tom Neely and, subsequently, Judge Dan Mike Bird presided. To oversee the estate, Wilson Friberg was designated as court-appointed receiver. 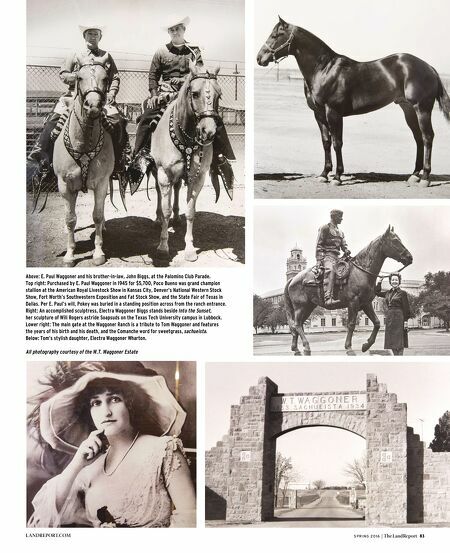 All the while, wealthy suitors journeyed to Vernon from across Texas and around the country to court the family. Media moguls, oil barons, millionaires, billionaires — none had any luck buying the ranch. Per Rick Perry, the contentious heirs and the nebulous price precluded a sale. 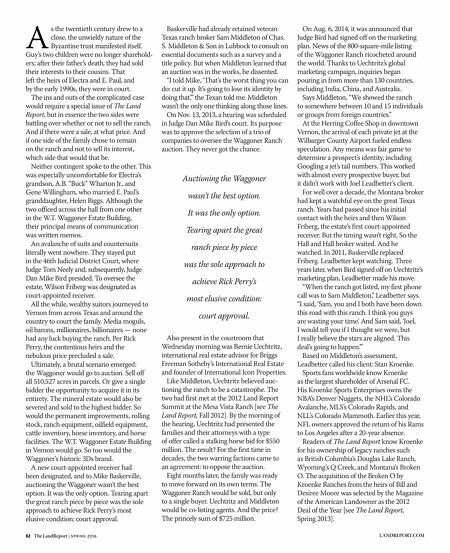 Ultimately, a brutal scenario emerged: the Waggoner would go to auction. Sell off all 510,527 acres in parcels. Or give a single bidder the opportunity to acquire it in its entirety. The mineral estate would also be severed and sold to the highest bidder. So would the permanent improvements, rolling stock, ranch equipment, oilfield equipment, cattle inventory, horse inventory, and horse facilities. The W.T. Waggoner Estate Building in Vernon would go. So too would the Waggoner's historic 3Ds brand. A new court-appointed receiver had been designated, and to Mike Baskerville, auctioning the Waggoner wasn't the best option. It was the only option. Tearing apart the great ranch piece by piece was the sole approach to achieve Rick Perry's most elusive condition: court approval. Baskerville had already retained veteran Texas ranch broker Sam Middleton of Chas. S . Middleton & Son in Lubbock to consult on essential documents such as a survey and a title policy. But when Middleton learned that an auction was in the works, he dissented. "I told Mike, 'That's the worst thing you can d o: cut it up. It's going to lose its identity by doing that,'" the Texan told me. Middleton wasn't the only one thinking along those lines. On Nov. 13, 2013, a hearing was scheduled in Judge Dan Mike Bird's court. Its purpose was to approve the selection of a trio of companies to oversee the Waggoner Ranch auction. They never got the chance. Also present in the courtroom that Wednesday morning was Bernie Uechtritz, international real estate advisor for Briggs Freeman Sotheby's International Real Estate and founder of International Icon Properties. Like Middleton, Uechtritz believed auc- tioning the ranch to be a catastrophe. The two had first met at the 2012 Land Report Summit at the Mesa Vista Ranch [see The Land Report, Fall 2012]. By the morning of the hearing, Uechtritz had presented the families and their attorneys with a type of offer called a stalking horse bid for $550 million. The result? For the first time in decades, the two warring factions came to an agreement: to oppose the auction. Eight months later, the family was ready to move forward on its own terms. The Waggoner Ranch would be sold, but only to a single buyer. Uechtritz and Middleton would be co-listing agents. And the price? The princely sum of $725 million. On Aug. 6, 2014, it was announced that Judge Bird had signed off on the marketing p lan. News of the 800-square-mile listing of the Waggoner Ranch ricocheted around the world. Thanks to Uechtritz's global marketing campaign, inquiries began p ouring in from more than 130 countries, including India, China, and Australia. Says Middleton, "We showed the ranch to somewhere between 10 and 15 individuals or groups from foreign countries." At the Herring Coffee Shop in downtown Vernon, the arrival of each private jet at the Wilbarger County Airport fueled endless speculation. Any means was fair game to determine a prospect's identity, including Googling a jet's tail numbers. This worked with almost every prospective buyer, but it didn't work with Joel Leadbetter's client. For well over a decade, the Montana broker had kept a watchful eye on the great Texas ranch. Years had passed since his initial contact with the heirs and then Wilson Friberg, the estate's first court-appointed receiver. But the timing wasn't right. So the Hall and Hall broker waited. And he watched. In 2011, Baskerville replaced Friberg. Leadbetter kept watching. Three years later, when Bird signed off on Uechtritz's marketing plan, Leadbetter made his move. "When the ranch got listed, my first phone call was to Sam Middleton," Leadbetter says. "I said, 'Sam, you and I both have been down this road with this ranch. I think you guys are wasting your time.' And Sam said, 'Joel, I would tell you if I thought we were, but I really believe the stars are aligned. This deal's going to happen.'" Based on Middleton's assessment, Leadbetter called his client: Stan Kroenke. Sports fans worldwide know Kroenke as the largest shareholder of Arsenal FC. His Kroenke Sports Enterprises owns the NBA's Denver Nuggets, the NHL's Colorado Avalanche, MLS's Colorado Rapids, and NLL's Colorado Mammoth. Earlier this year, NFL owners approved the return of his Rams to Los Angeles after a 20-year absence. Readers of The Land Report know Kroenke for his ownership of legacy ranches such as British Columbia's Douglas Lake Ranch, Wyoming's Q Creek, and Montana's Broken O. The acquisition of the Broken O by Kroenke Ranches from the heirs of Bill and Desiree Moore was selected by the Magazine of the American Landowner as the 2012 Deal of the Year [see The Land Report, Spring 2013]. Auctioning the Waggoner wasn't the best option. It was the only option. Tearing apart the great ranch piece by piece was the sole approach to achieve Rick Perry's most elusive condition: court approval.